Dimensions 1.50 by 8.50 by 10.75 in. Drawing on three decades of experience with home baking, the author of the award-winning Baking with Julia introduces three hundred tempting recipes for home bakers, offering an array of spicy muffins, sweet breads, brownies and cookies, tarts, and other special treats, highlighted by a helpful glossary, expert baking tips and advice, and full-color photographs. Dorie Greenspan has written recipes for the most eminent chefs in the world: Pierre HermÃ©, Daniel Boulud, and arguably the greatest of them all, Julia Child, who once told Dorie, âYou write recipes just the way I do.â Her recipe writing has won widespread praise for its literate curiosity and âpatient but exuberant style.â (One hard-boiled critic called it âa joy forever.â) In Baking: From My Home to Yours, her masterwork, Dorie applies the lessons from three decades of experience to her first and real love: home baking. The 300 recipes will seduce a new generation of bakers, whether their favorite kitchen tools are a bowl and a whisk or a stand mixer and a bakerâs torch. Even the most homey of the recipes are very special. Dorieâs favorite raisin swirl bread. Big spicy muffins from her stint as a baker in a famous New York City restaurant. French chocolate brownies (a Parisian pastry chef begged for the recipe). A dramatic black and white cake for a âwowâ occasion. Pierre HermÃ©âs extraordinary lemon tart. The generous helpings of background information, abundant stories, and hundreds of professional hints set Baking apart as a one-of-a-kind cookbook. 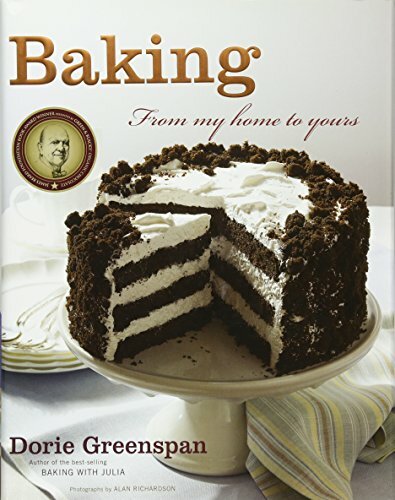 And as if all of this werenât more than enough, Dorie has appended a fascinating minibook, A Dessertmakerâs Glossary, with more than 100 entries, from why using oneâs fingers is often best, to how to buy the finest butter, to how the bundt pan got its name. About: Offers more than three hundred of the author's favorite recipes, including split-level pudding, gingered carrot cookies, and fold-over pear torte, and provides baking tips and a glossary.